Volunteering is a great way to teach children about the spirit of giving. Here are some innovative ways to get your child involved. It's important to remember the origins of Memorial Day. Here are some ways for parents to teach their children to honor our nation's defenders. 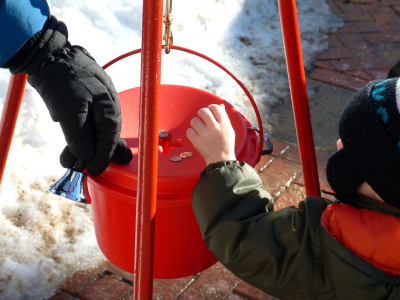 Five holiday volunteering ideas that can make a huge difference in your community this year. What do kids really gain from working and playing in the garden? Here are the skills that kindergarteners learn from all that digging. Check out these 10 volunteering ideas that allow any kind of kid to help in a hands-on way and learn to love the feeling of giving back. What are the consequences and what can parents do about it? Experts agree, our ocean is in crisis. Luckily, it isn't too late to make a difference. Here's how your kids can help. If your teen has a taste for treasure, technology, or just a love of adventure, then "geocaching" might be just the thing. There's nothing like a family movie night to wrap up the holidays. Here's a list of holiday classics, both old and new. Botanical gardens can be magical places for children, offering wonderful smells, beautiful colors and best of all, the chance to get good and grubby! Make King Day a Day "On"
Letterboxing: A Family Friendly Treasure Hunt!